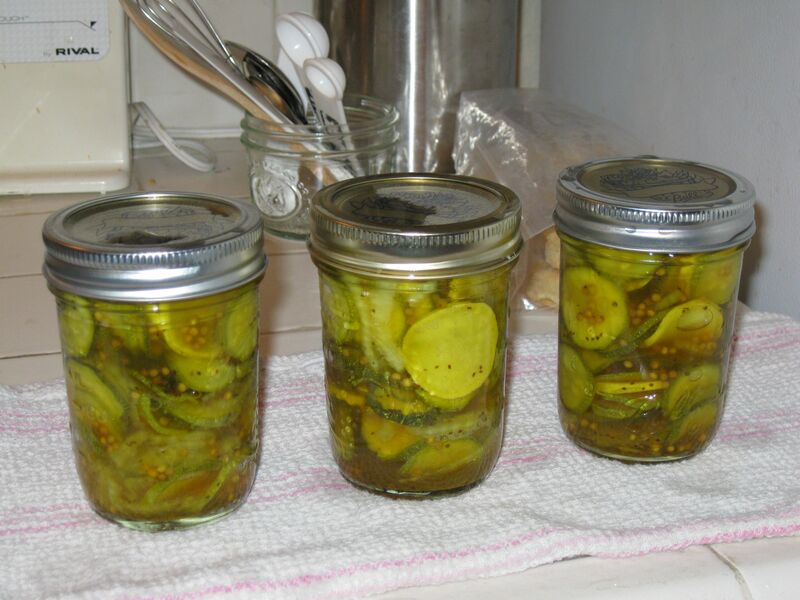 These are bread-and-butter zucchini pickles from Linda Ziedrich‘s The Joy of Pickling. This is only the second recipe I’ve tried out of her book. I’m hoping I did this right, because I haven’t done a lot of pickles before. I quartered the recipe because I didn’t have all that much zucchini (and you can see a little yellow squash snuck in there too), but I only halved the brine, because I wasn’t sure I’d have enough if I didn’t. It might be too much. I don’t know. But the jars all pinged shut, so tomorrow morning I’ll check the seals and see if they’re good, and then stash them in the back pantry for three weeks. Oh. You’re looking at me funny about that “back pantry” thing. Well, here’s the deal — my kitchen doesn’t really have a proper pantry. We have some IKEA shelves that handle most of the things that I use all the time, and then we’ve converted part of the linen closet as pantry storage as well. That’s the “back pantry”. It mostly holds things like vinegar, honey, and oil. It’s also a good dark place to stash foods that need to be kept in the dark, which won’t work with the front pantry.